"I was once told that good historians are accurate, great historians are storytellers. If so, then the author is most definitely one of the latter" - Tim Callaway, Aviation Classics. You'll be £25.00 closer to your next £10.00 credit when you purchase Malta's Greater Siege. What's this? This is a true historical account of war in the air, at sea and on land in the battle for Malta's survival in the Second World War. It was a battle which decided the outcome of the war in North Africa and the Mediterranean. 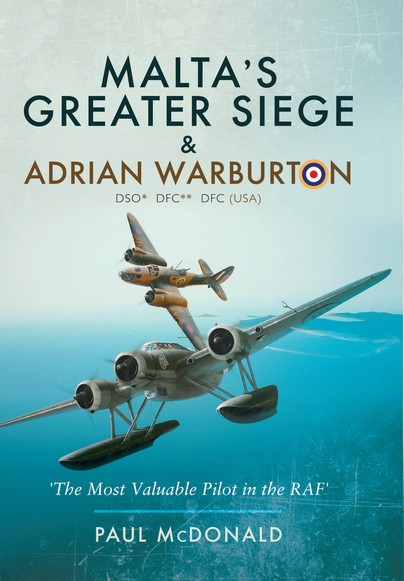 Adrian Warburton, the airman described in the subtitle by Marshal of the Royal Air Force Lord Tedder, went missing in 1944 in a single-seat American aircraft. He had flown at least 395 operational missions mostly from Malta. Unusually for a reconnaissance pilot, 'Warby' as he was known was credited with nine aircraft shot down. He lay undiscovered for sixty years. He is the RAF's most highly decorated photo-recce pilot. In Malta, Adrian met Christina, a stranded dancer turned aircraft plotter in the secret world deep beneath Valletta's fortress walls. She too was decorated for heroism. Together, they became part of the island's folklore. How important was Malta and the girl from Cheshire to the man behind the medals? This tale takes the form of a quest opening in a cemetery in Bavaria and closing in another in Malta. In between, the reader is immersed within the tension and drama surrounding Malta's Greater Siege retracing the steps of the main characters over the forever changed face of the island following its heroic victory. It is both harrowing and enlightening, like most books on the subject, but more so because of its breadth and depth, leaving the reader awestruck at the resilience of those with their backs to the wall. The epic fight for survival by the Island of Malta is a collection of many incredible stories and, surprisingly, a great number of those were not told adequately in the 75 years since the Siege of Malta. Publishers often time the publication of new history books to coincide with important anniversaries, bringing a welter of very good books to market. The reader then has to decide how many can be afforded and find shelf space for them. Amongst a crop of great new Siege of Malta books this is one that should not be avoided – rob your grannies, build a bookcase, whatever it takes. – Most Highly Recommended. There are many books written about people and places at war. These are often lists of events and names which lack the human element. The drives, ambitions, hopes and dreams of the people whose actions affect the events are lost, subsumed in a sea of detail. The what is revealed, the why is missing in action. Then, occasionally, there appears a history with warmth and character that gleams like sunshine, casting a light of understanding on its players and bringing them to life. This is such a volume which puts it firmly in that rare category of histories. Make no mistake, the detail is still here but the facts are informed and coloured with the glorious frailties of humanity. This is a fascinating story with two interesting leads. It also gives a sense of life under siege in the middle of the Mediterranean. A tragic and touching tale of two people thrown together amidst dramatically unfolding history. The reader is invited to travel back to Malta's Greater Siege, a time of great tension and fear. There are many books written about people and places at war. These are often chronologies, lists of events and names culled from official records which, while being accurate, lack the human element. The drives, ambitions, hopes and dreams of the players, the people whose actions affect the recorded events are lost, subsumed in a sea of detail. The what is fully revealed, the why is missing in action. Then, occasionally, against these grey monoliths of fact appears a history with warmth and character that gleams like sunshine, casting a light of understanding on its players and bringing them to life. This, Paul McDonald’s second book, is such a volume, his fascination with and respect for the stories he has chosen to tell puts it firmly in that rare category of histories. Make no mistake, the detail is still here, Paul’s research can only be described as painstaking in every respect, but the facts are informed and coloured with the glorious frailties of humanity. In this case, that is a particularly difficult task, as he has chosen to tell not one story in this book, but five. The first of these stories is that of Malta and its hardy people during the Second World War. In this story Paul sets a scene, describing the pre-war island, then follows how it changed through the siege. The detail of events is interspersed with snapshots of the Maltese people at war; moments of triumph, as the crowds on the harbour cheer the safe arrival of transport ships bringing vital supplies to the island are mixed with moments of horror and pain, as a young man digs through a bombed building for three days and nights without pause to find the body of his girlfriend. Against this backdrop four more stories weave around each other to fill the tapestry. The first of these four is the story of the men and women of the Royal Air Force, Army and Royal Navy units who fought on the island. This is told in detail, from the theatre and local commanders to the pilots and groundcrew of the fighter, bomber, torpedo and reconnaissance squadrons that made Malta such a thorn in the side of the Axis powers. Many people are portrayed, all of whom are fleshed out with Paul’s talent for characterisation, the losses in the savage fighting are felt all the more keenly as a result. Taking the lead in the narrative are the stories of three individuals. The legendary reconnaissance pilot Adrian Warburton, the dancer Mary Christina Ratcliffe and the talented and resourceful aircraft engineer Jack Vowles. Despite his fame, Adrian Warburton has, up until now, been something of a mystery, an ethereal figure that few have managed to clearly explain or understand. In tracing his story from his schooldays to his lonely death in 1944, Paul has brought a fresh understanding to this complex character, putting the reader in the cockpit with him through interviews with those who knew Warburton best. One of these was ‘young Jack’, Jack Vowles, an intuitive and inventive engineer who worked closely with Warburton, finding ways to improve the performance of his aircraft in between patching them up. He was able to work closely with Paul on the creation of the book, his colourful insights are scattered throughout it. Christina of Malta is herself one of the heroes of the siege, a woman who entertained the people on Malta as a part of dance and music acts as well as a working as a plotter in the air operations centre on the island. Her love affair with Warburton is sensitively handled, the stories of their time together revealing many human traits, including the pilot’s puckish sense of humour and the dancer’s resilient spirit. It is these insights that makes the history on these pages come alive. There is so much detail of interest, from the fact that Warburton attended St Edward’s school in Oxford at the same time as Guy Gibson to the fact he was a close friend of Elliot Roosevelt, the son of the US President and commander of the US reconnaissance units in the Mediterranean theatre, all of which serve to bring Warburton into sharp focus for the first time. It is this focus that makes the last chapter of this remarkable book both compelling and believable, telling as it does the story of Warburton’s last flight from the point of view of the enigmatic pilot. A wealth of known detail is expanded by supposition, thoughts you can imagine crossing the pilot’s mind. The last line is utterly chilling. Paul McDonald is uniquely qualified to write this book. Not only was he a Royal Air Force reconnaissance pilot, but he was also based on Malta during his career and got to know many of the people he brings to life in these carefully crafted pages. I was once told that good historians are accurate, great historians are storytellers. If so, then the author is most definitely one of the latter. A new book telling the amazing story of enigmatic World War II hero Wg Cdr Adrian 'Warby' Warbuton also looks at the unconventional pilot's romance with dancer Christina Ratcliffe on the island of Malta. The book features previously unpublished material about Warby - who collected six gallantry awards in less than three years - and the glamorous Christina, who was also decorated for heroism. The author, a distinguished and successful RAF recce pilot, tells three vivid stories of the air war over Malta. Firstly he sets Malta's battles in the strategic context and their influence on the war in North Africa: the early inadequacy of the fighter and AA defences; the desperate days of 1941/42, when Malta became the most bombed place on earth, but continued disrupting Rommel's supply lines; the heroism of outnumbered and outgunned aircrew, supported by the bravery of ground crew and Maltese civilians; the critical role of the Royal and Merchant navies in resupply of munitions, fuel and food; the turn of the tide; and the growing strength of the defenders turned attackers. Woven into this background he explains the role of loner recce pilot Adrian Warburton, who with great daring and good luck ('Warby's Luck') brought back time and again the most detailed photos of Taranto, Naples, Palermo, Syracuse, Catania, Pantelleria Tripoli and Tunis allowing the RN and RAF to sink and disrupt many Italian naval forays, and facilitate the invasion of Sicily and Italy. In three years Warburton rises from Pilot Officer to Wing Commander, and is awarded two DSOs and three DFCs. He was called by senior commanders ' the most valuable pilot in the RAF'. The author records the day when Warby goes missing over Germany, and the near 50 year gap before his aircraft crash site is identified. The third romantic story wound seamlessly together by the author is Warby's deep and enduring love affair on Malta with beautiful and fearless dancer turned war room plotter, Christina, and how Warby's loss deeply affected her. The writer knows Malta well, has a deep affection for the island and its people, and has written a thoroughly-researched, exciting and important book, which I heartily recommend.